MOSCOW (AP) — Russia’s President Vladimir Putin has met with Khabib Nurmagomedov to congratulate him on winning the UFC lightweight title, and defended the fighter’s actions in the brawl that followed his victory over Conor McGregor. Putin hailed Nurmagomedov’s “convincing” victory in the highly anticipated mixed martial arts bout in Las Vegas on Saturday, and said the champion’s decision to then climb over the cage and fight with members of McGregor’s corner had been provoked by insults. 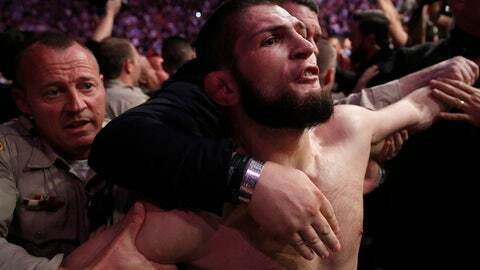 The brawl also featured two men from Nurmagomedov’s entourage climbing into the cage and attacking McGregor. Nurmagomedov told Putin on Wednesday he was sorry that he lost self-control, but that he had heard McGregor’s camp insulting his father and his country. Putin joked that he would ask Nurmagomedov’s father, who was also present at the meeting, not to punish him too severely.